Game of Thrones’ Season 6 marketing has largely revolved around Jon Snow. The first poster clearly focused on the character—or at least actor Kit Harington—and the Bran(d) new teaser gives us an awful lot of eerie footage of Snow before giving us one ominous statement from Bran, who returns to the plot this season. Check it out, below. Man, Game of Thrones is good at marketing. Most of the stuff in this brand new teaser is actually old footage. (former season spoilers, obviously) It's stuff like Jon Snow getting stabbed at the end of Season 5 and even older footage than that, including Jaime Lannister getting his hand cut off back in Season 3. 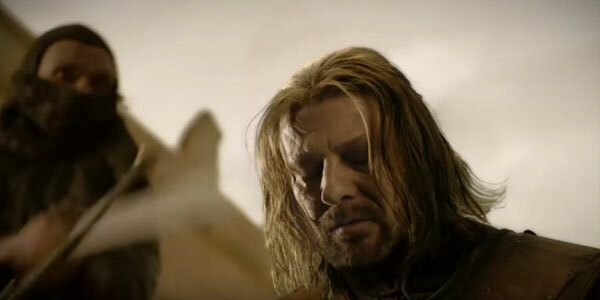 There are shots of the long-dead Ned Stark and his dead firstborn son, Robb. There are fights with white walkers and swords forged from Valyrian steel. It all makes for beautiful imagery, but it's imagery we have seen before. Does this look familiar? Still, however, a portion of the trailer seems brand new. A voice is talking about how the ink is dry on the past. That voice is none other than the Three-Eyed Raven, voiced by Max von Sydow (who is taking over for Stuan Rodger, who briefly played the character in Season 4). The plotline North of the Wall, including the Three-Eyed Raven, Bran, Hodor and Meera was not visited at all during Season 5 of the series. However, we’ve known that Bran would play a major part in Season 6, and we finally have gotten our first hints regarding what’s happening. While we look through the familiar footage, we do get some new ideas in regards to dialogue and what Bran has been up to with all of that training he has been involved with. The Raven tells Bran he has three tasks: to watch, to listen and to remember. Remembering seems to be key, as what is set in stone in the past can still influence the future, as Robb Stark and others, like Stannis, have learned the hard way. After taking the advice, Bran seems to have an epiphany moment and makes a statement that is still giving us goosebumps. They have no idea what’s going to happen. We still have a few months before Game of Thrones Season 6 hits the schedule. HBO tends to like the slow burn when it comes to releasing new footage for the series, so it may be a little while before we get the full Season 6 trailer. But in regards to the marketing, I really like what I've seen so far. And as Bran noted above, despite the fact I've read all of the released George R.R. Martin A Song of Ice and Fire books and read the extra chapters, we don't really have a clear idea of where the show is going this season, at all. It's pretty exciting. If you would like some hot facts regarding casting and more, you can check out our what we know feature regarding Season 6.